Rockers, sheds, ballons and more are the rock act prizes. Join us right after the jump for the first part of their walkthrough! Homer: Hey, it’s an inflatable concert pig, just like at Hullabalooza. Lisa: It’s a symbol of the corporate greed of the record companies. Homer: Except, now all the greedy record companies are out of business. Bart: So now it just means “Caution: a fat man may try to sing”. 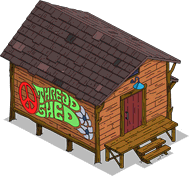 Wiggum: The Thread Shed! That would be perfect for buying undercover costumes. Wiggum: I have reason to suspect that there may, just may be, drugs in rock and roll. Lou: Fine I’ll dress up as Prince, you can dress as Meatloaf. Wiggum: Did you say meatloaf? The drugs can wait, I’m hungry. Nick Delacourt: Forget it, Shredder. I’m not going on tour. I’m afraid of dying out there. Shredder Stevens: Oh, don’t worry about that. We mostly replace you with a drum machine anyway. Nick Delacourt: Did not know that. But I mean really dying. Shredder Stevens: You’re worried about the drummer’s curse, eh? How they all die young? Nick Delacourt: No, I’m worried about all the fatty foods on the road. I have rock-star level cholesterol. Homer: Nick, you can’t just hide out in the Brown House. 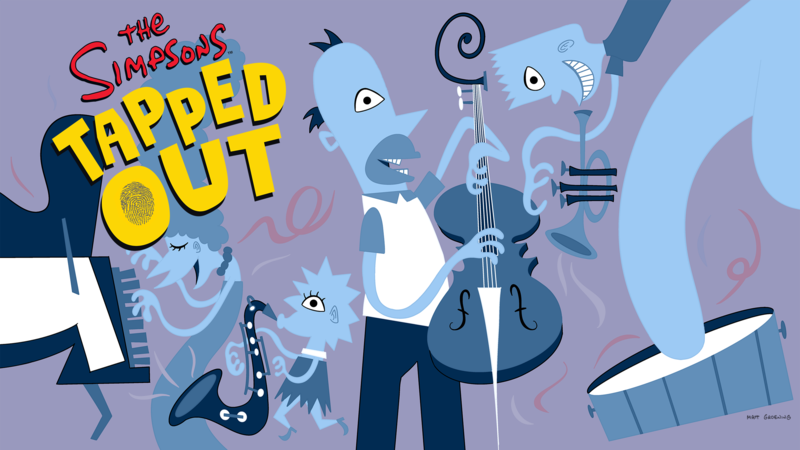 That’s where everyone goes to do weird things… and you’re just making it weirder. Marge: If you’re worried about your health, you should go see a doctor. Nick Delacourt: Hm. As a flakey musician, I usually go see a crystal healing witch. But I guess I could try Western medicine. Homer: Did Hibbert give you a clean bill of health? Nick Delacourt: He also scheduled me for a colonoscopy. Bart: How’s your obsession with death coming along, Nick? Nick Delacourt: The obsession is doing great. But I could do with some cheering up. Lisa: The number one step in staying healthy is getting exercise. Nick Delacourt: Of course! And I know the perfect exercise. Lisa: Twirling your drumsticks is exercise? Nick Delacourt: It’s exhausting physically AND emotionally. What if you drop a stick just when you need to beat out a riff? Nick Delacourt: That’s why drummers all keep a spare drumstick down their pants. Bart: I wondered why they walked so funny. Nick Delacourt: Oh, that’s because they’re drunk. Bart: Hey, Nick. You don’t seem so worried about your health anymore. Find a way to break the curse? Nick Delacourt: Yep. Check out this line of vitamin supplements I’m taking. 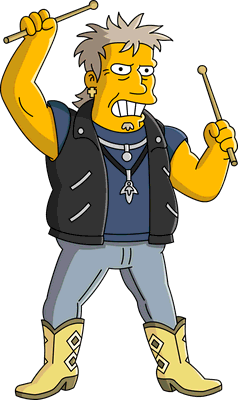 Bart: *reading* “Nick Delacourt’s Hi-hat Health Supplements”. Bart: These really make you feel better? Nick Delacourt: The money I make from selling them does.